Learn traditional methods artists used up until the start of the 20th century. Use light and dark tonal “values” to create a sense of volume. This structured course uses straightforward step-by-step exercises, specifically designed to clearly explain and familiarise students with the fundamental principles of representational painting. In depth, individual instruction and demonstrations will be given throughout. It is divided into three parts which the average student will be able to complete in one year. Why learn to paint with Alex? Drawing and painting from life isn’t easy. The first time we attempt an ambitious subject like the human figure or a portrait, we struggle and when we do, it’s easy to become discouraged. But why expect to succeed at such a difficult task, without being shown how? With any other activity, a sport or learning to play a musical instrument you start by learning the basics. Representational art is no different. There are fundamental principles, like natural laws, to help us make sense of the phenomena we see when working from life; proportion, light and colour. If you want to produce work that is really lifelike, you need a thorough understanding of these principles. Up until the 20th Century, these fundamental principles formed the mainstay of art education, but when representational art went out of fashion these techniques and practices stopped being taught in art schools. Many of today’s tutors have lost this knowledge. Alex Tzavaras is a contemporary realist artist who is believes strongly in rediscovering the methods used to train the artists of the past and preserving them for future generations. Developed in the 19th Century, Mass Drawing is a system of measuring proportion which involves simplifying the complicated appearance of a subject into large abstract shapes or “masses” before working on details. It is essential for working with oil paint directly onto your canvas using the “Alla Prima” technique favoured by artists like John Singer Sargent. With the endless variety that nature presents us with, colour can be one of the most perplexing areas to tackle when painting from life. Fortunately, there are a few basic rules we can use to make working in colour much less complicated. The key principle of Relative Colour Temperature. How to replicate the interplay of warm and cool colours to create stunningly lifelike images. Drawing and painting the human body has been a core practice, used to train representational artists throughout history. One of the most demanding forms of study, to be successful requires a firm grasp of all the principles of working from life. 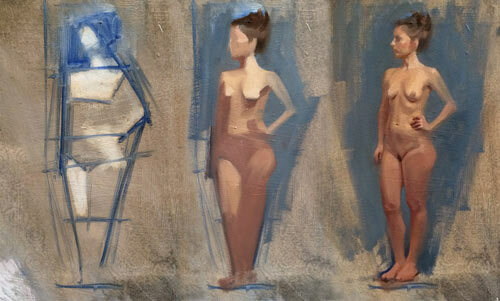 Further develop their understanding of tonal values and edges to sculpt or “model” the human form with paint. Nominally this course takes one year of of one day a week’s study to complete. Those who can only do half days or evenings may take longer to work through the course and there may be some who already have some of the skills in place who will progress more quickly. In each case Alex will make sure that you are working at the level most appropriate to you. 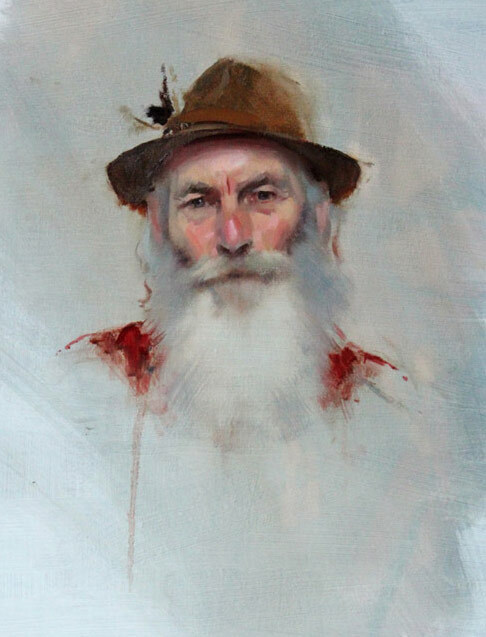 ” I came to Alex’s class as a complete beginner in oil painting. He taught us all aspects of using oil paints, brushes, canvas, palettes, cleaning etc. We also learned the mass technique of painting which is easy to understand but tricky to master but Alex patiently corrected our technique and by the end of the course we had a painting to be proud of. Concessions may be available, please call to discuss. If you’d like to attend this workshop please register your interest by filling in the form below and paying a £50 deposit to secure your place. We will assume you are signing up for the next term unless you tell us otherwise. Pay your £50 deposit securely by clicking on the button below.